I wasn’t wearing a helmet when I was riding my motorcycle. Can I still get compensated for my injuries? I was partly at fault for my car accident. Can I still recover anything? Yes, even though you are partly at fault for your car accident, you can still get compensated for your injuries and the damage to your car. Theoretically, even if the other party is only 1% at fault, you can still get compensated from their insurance company, although, they will only owe you 1% of your damages. This concept is known as comparative negligence. 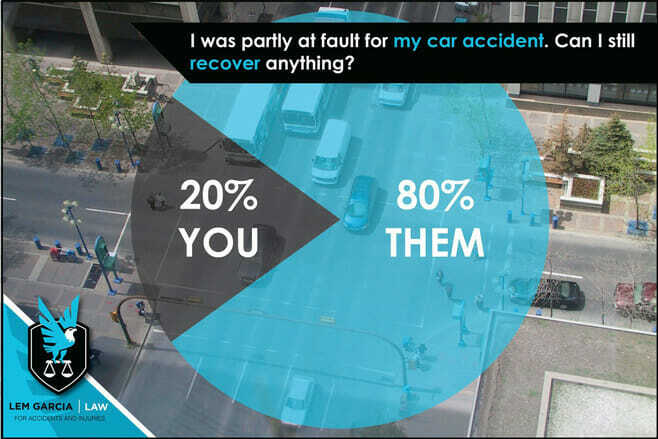 Essentially, your recovery is reduced by your percentage of fault. For example, if you’re going through an intersection at 20 miles per hour over the speed limit and an oncoming car tries to make a left turn in front of you, you could be partially at fault. Let’s say the insurance company or jury apportions 20% of fault to you because you were speeding and 80% to the other person because they made a dangerous left turn. Let’s also say your damages were for $10,000.00. Your recovery will be reduced by your portion of fault, which is 20%, and you will recover $8,000.00. If you’re involved in a car accident and you believe that you were partially at fault, West Covina car accident attorney, Lem Garcia, can help. Lem Garcia Law handles personal injury cases only and is happy to answer any questions or concerns that you may have. By Lem Garcia, car accident attorney in West Covina.